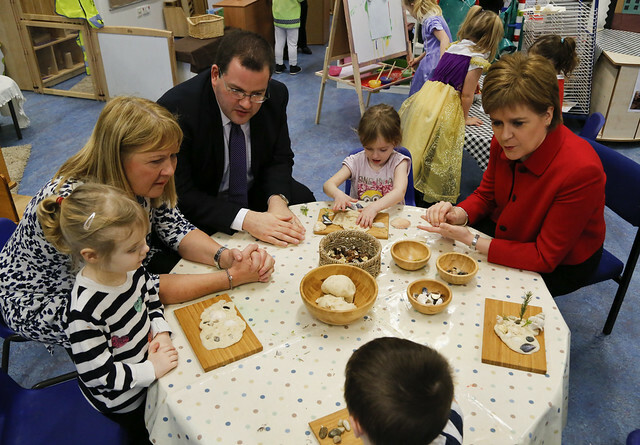 An extra 435 graduates are to be recruited for nurseries in deprived areas in Scotland through a £1.5 million investment to expand early learning and childcare, First Minister Nicola Sturgeon announced today while visiting the nursery at Gorebridge Primary School. The funding is the first step towards realising the commitment to ensure nurseries in the most deprived areas benefit from an additional graduate by 2018 – either a teacher with early years expertise or a graduate practitioner with the BA Childhood Practice award. Increasing the number of teachers and graduates in nurseries is absolutely crucial to tackling the attainment gap right from the start of a child’s education. We all recognise the importance of high quality early learning and childcare to the development of our young people, and access to the right staff with the right expertise is key to this. By providing the best possible start in life we can ensure our young people develop the skills and confidence they need to reach their full potential, we know this is particularly true for children who face the greatest disadvantage.